Community Blog by coffeewithgames // What is the Wii's most played FPS in the U.S.? Call of Duty? Conduit? GoldenEye? 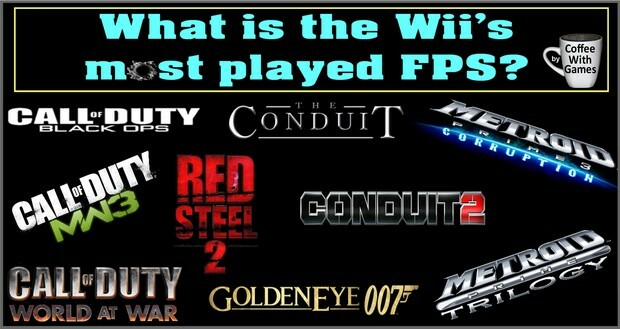 What is the Wii's most played FPS in the U.S.? Call of Duty? Conduit? GoldenEye? The Wii has had a variety of first-person shooter (FPS) games released during the last 6 years, some of the more popular Wii FPS titles you can see in the image above. With more than 20 FPS games released for the Wii, at least 10 have had online multiplayer, while some have been more single player focused like Metroid Prime 3: Corruption and Red Steel 2. What is the most played FPS game on the Wii in the United States, according to the overall total hours reported and the average hours reported "Per person" on the Nintendo Channel? Brew yourself some coffee, and let's take a look! 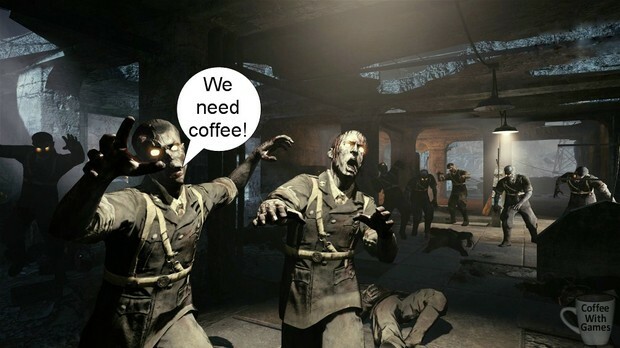 How most Call of Duty: Black Ops 2 players probably feel after the last few days! Call of Duty: Black Ops is the Wii's most played game from the Call of Duty series, according to the average hours reported "Per person" and also the total hours reported on the Nintendo Channel for all of the Call of Duty games, as well as all of the other FPS games with data reported through the Nintendo Channel. Call of Duty: Black Ops was released on November 9, 2010 for the Wii, with a MSRP of $49.99. The game was developed by Treyarch and published by Activision, and received an ESRB rating of "MATURE" with "Blood and Gore, Intense Violence, Strong Language" listed as content for gamers and parents to be aware of. The data shown in the image below is for the gameplay hours reported from U.S. Wii owners, with 734 days possibly report. Black Ops now has approximately 200,601 Wii owners from the U.S. that have reported playing the game through the Nintendo Channel, which is about 23,428 more Wii owners that have now reported data for the game, since the data report in June. The game's reported average play-time is now 84 Hours 22 Minutes "Per person", over 2 hours higher than June's reported average "Per person", and the average played per day/time is about 2 Hours 36 Minutes. This simply means each time a Wii owner sits down to play Black Ops, they are spending about 2.5 hours playing it each time. It could be zombies. It could be standard online multiplayer. It could be single player. It could be all of them, but whatever it is, the game is still being played a lot. What about reviews for Call of Duty: Black Ops on the Wii, has anything changed since June? Well, the game still has a "professional" review score average of 81.47%, based on 17 reviews on GameRankings.com. It now has a customer review score average of 77.30%, based on 141 customer reviews from Amazon.com. Millions of gamers are probably playing Call of Duty: Black Ops 2 on their PlayStation 3s, Xbox 360s, and PCs as I'm typing this. While Black Ops 2 is not releasing for the Wii, as confirmed by an Activision representative in October, the Wii was home to every other Treyarch developed Call of Duty game. I haven't played my copy of Black Ops on the PS3 in a while, but I did enjoy the online multiplayer when I played it, and the zombie mode as well. I didn't go out and get a copy of Black Ops 2 for my PlayStation 3, because I'm debating on grabbing the game with my Wii U this Sunday. If you haven't seen any footage of Black Ops 2, take a look at the launch trailer below! I am surprised that Black Ops on the Wii has become the most played FPS for the system, in both the hours reported "Per person" and the overall total hours reported. I thought that Call of Duty: World at War would hold onto the most played according to "Total Hours" reported because of Modern Warfare 3 potentially getting purchased and played by Black Ops players, but the data just over the last few months shows Black Ops is on a steady increase each week. I'm really glad to see Treyarch releasing Black Ops 2 for the Wii U, and while it's unfortunate for Wii owners that want to play Black Ops 2 but won't be getting a Wii U soon, hopefully the game makes use of the Wii U GamePad in some innovative ways that might even help sell a few more Wii U consoles to Call of Duty fans. Have any of you been playing Call of Duty: Black Ops on the Wii, perhaps while waiting on Black Ops 2 and the Wii U's release next week? 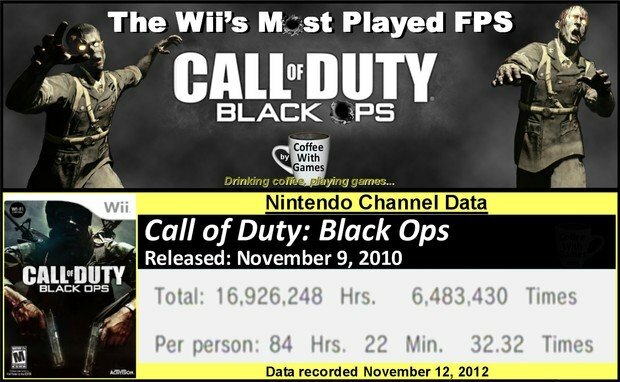 If you have played Black Ops on the Wii, do you know how many hours you have put into the game? Also, did any of you go to a midnight launch for Black Ops 2, or are any of you planning on buying Black Ops 2 for the Wii U?